Note: This VIN number belongs to an Acura vehicle. Please click here to visit Acure eStore. Note:Currently we are unable to process your VIN number. Please use our model chooser and continue the shopping process. Note: We are sorry but Accessories are available for most 2003 and newer models. However, if you would like to shop replacement parts for your specified model, please click here. 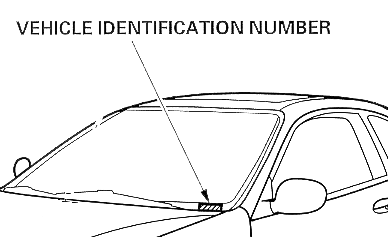 The VIN (17-digit ) is located on a plate fastened to the top of the dashboard. You can see it through the windshield on the driver's side. The VIN is also available from your vehicle registration or insurance card.